Penetrations are one of the greatest threats to the integrity and long-term performance of flat roofs. So how do we ensure that they are absolutely necessary, correctly detailed and properly installed? Daniel Bosworth, Design & Technical Manager at SIG Design & Technology discuss these questions and more. What types of penetration are typically required in flat roofs? Common penetration details include soil vent pipes, hot pipes from boiler flues or log burners, electrical cables for air-conditioning units, extraction ducting and tracks for mechanical window cleaning systems. 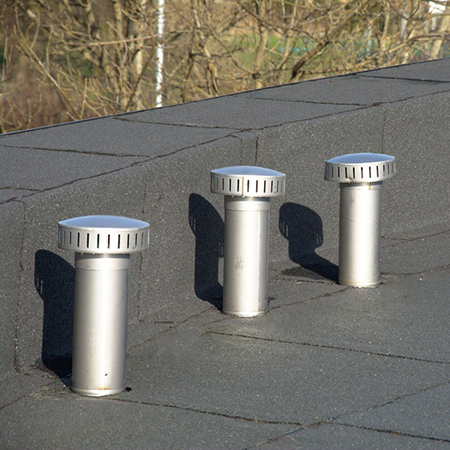 Rainwater outlets are also classed as penetrations as they go down vertically through the deck, and/or horizontally through the parapet. Overflow outlets are another common example. Penetrations are often required in cold roofs to ensure the continuous circulation of air between the underside of the deck and insulation layer. There is also increasing demand for mechanically-fixed photovoltaic arrays, particularly on large commercial projects. Bespoke designs for these and roof tracks should be discussed at an early stage with the waterproofing manufacturer to ensure that the detailing is robust. Should specifiers try to design out penetrations where possible? Penetrations are not problematic if they are designed properly. Indeed, they are a necessary and important part of the detailing process, as they allow flat roofs to house plant and other services, thereby maximising internal space. Reputable flat roofing manufacturers should have appropriate detail drawings for most penetration requirements. This will ensure that British Standards and codes of practice are properly maintained, including minimum 150mm upstands and mechanical restraints at waterproofing termination points. For more complex and unusual penetrations, specifiers can consult specialist companies that design and manufacture proprietary systems. A good example is Nicholson, which has developed an integrated, stainless steel fixing point with a membrane flange for connecting PV arrays to bituminous and single-ply membranes, including IKO Armourplan PVC roofing. 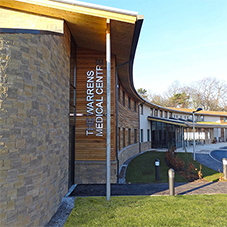 How should specifiers approach the design of flat roof penetrations? First, seek design advice from the waterproofing manufacturer at the earliest opportunity, and use its robust details and solutions as part of the flat roof design. SIG provides a deck-up design, supply, installation (through our Design & Technology Accredited Contractors) and guarantee service that is product-neutral. This allows specifiers to get advice they can rely on, backed by PI insurance and the credibility of a FTSE 250 company. Second, where appropriate, use an approved proprietary system that conforms to the waterproofing manufacturer’s recommendations and/or guidelines. What mistakes do specifiers typically make when it comes to designing penetration details? One of the biggest failings is insufficient detail on the working drawings, leading to roofing contractors improvising solutions on site – often with mixed results. It is important to ensure that all penetration details meet British Standards BS6229:2003. 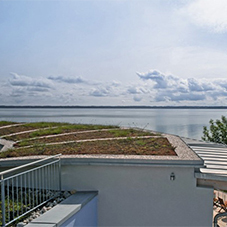 There is a common misconception with ballasted, inverted and green roofs that the minimum 150mm dimension for upstands is taken from the top of the waterproofing layer, rather than the top of the finished roof. Architects should avoid placing penetrations too close to parapet walls, as it can be difficult to achieve adequate waterproofing on site due to inaccessibility and surface proximity. What typical detailing methods are used to seal flat roof penetrations? Typical methods include banding, pitch pockets, and cover flashings. Banding is typically used to seal soil vent pipes on single ply roofs, such as FDT Rhepanol PIB, and involves wrapping an unreinforced membrane around the pipe to a minimum height of 150mm. An approved sealant is then applied to the top of the membrane ‘upstand’, before it is tied off with a jubilee clip. A storm collar can be fixed above the band to provide further protection from the elements. 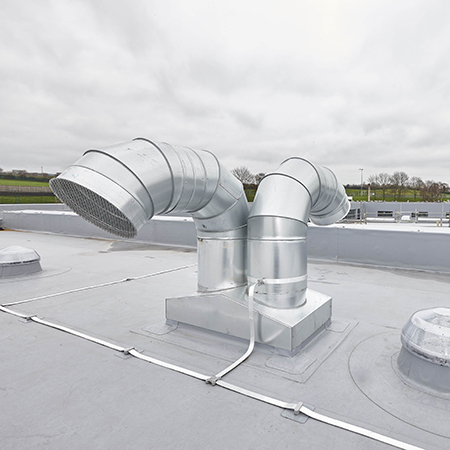 A similar detail can be used on cold applied liquid roofs, such as SIG’s SIGnature Liquid Waterproofing system, eschewing the need for sealants and fastening clips. Pitch pockets are commonly used on hot-melt roofs. 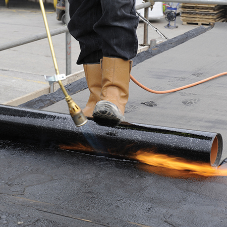 A metal barrier is installed around the penetration with a 20mm void on all sides, before a layer of hot melt is poured in. This kind of detail is particularly useful for sealing multiple penetrations and odd-shaped components. Cover or counter flashings are used to seal base flashings. A good example is the metal sleeve used to protect and seal plastic pipe penetrations on hot melt roofs. The cover flashing is placed over the top of the sleeve and around the pipe, extending down to cover the top of the waterproofing upstand. 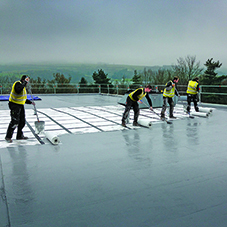 Cover flashings are also used to seal rooflights, upstand kerbs and plant support bases. What steps should specifiers take to ensure that penetrations are correctly installed on site? Make sure that the roofing contractor is accredited for the system being installed, and that suitable inspections are being undertaken by both the roofing subcontractor and waterproofing manufacturer. Furthermore, check that the design drawings are readily available and being used on site. Key design stage work will be wasted if the roofing installation contractor and roof inspection team are unaware of the agreed installation method. Do roof penetrations require ongoing maintenance? Sealants, typically used in banding penetration details, are classed as maintenance items, and should be subject to minimum twice-yearly inspections as recommended in BS6229:2003. This is primarily a visual test to ensure that they are functioning properly. The same frequency of inspection also applies to rainwater outlets and all other roof areas to clear any debris where required. What kind of guarantees does SIG give in terms of waterproofing performance? Most SIG guarantees apply to the roofing product and typically range from 10-25 years. 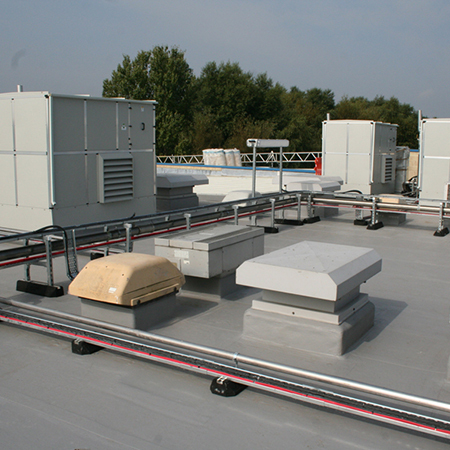 Crucially, the SIG Design & Technology Accredited Contractor scheme (DATAC) provides assurance that the company’s roofing systems are correctly installed. It also has a dedicated team of Field Technicians who provide site monitoring. Some SIG roofing systems, such as the IKO Armourplan PVC single ply membrane, can include workmanship as part of the guarantee. If, for example a penetration problem is highlighted following a roof inspection, SIG will not issue a guarantee until the issue has been rectified and supported with photographic or visual on site evidence. Reproduced by kind permission of Architecture Today.